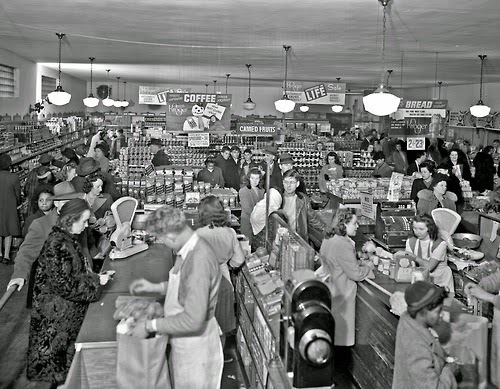 Kroger grocery store, Lexington Kentucky, 1947 - Photo by Lafayette Studio. 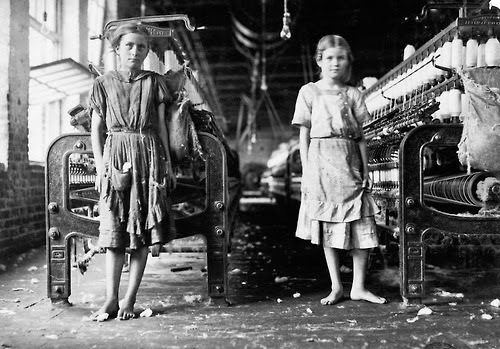 Child Labor in a New England - Young spinners in a Cotton Mill, 1911. 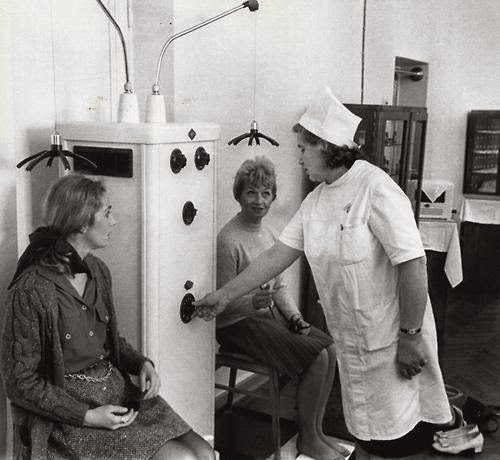 Two American tourists trying out an electrical headache relief machine at a spa in Sochi, Soviet Union, Circa 1970. 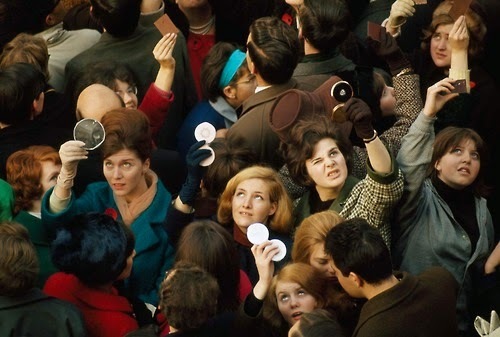 Women use compact mirrors in a packed crowd attempting to catch sight of Queen Elizabeth II - London, England - 1966. 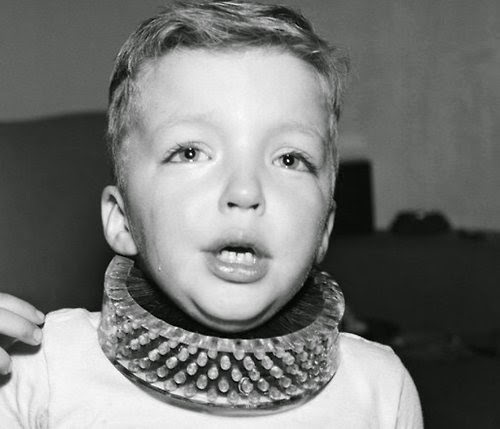 "The Neck Brush", designed to clean a child's neck while they play. Invented by the Los Angeles Brush Corp, 1950. 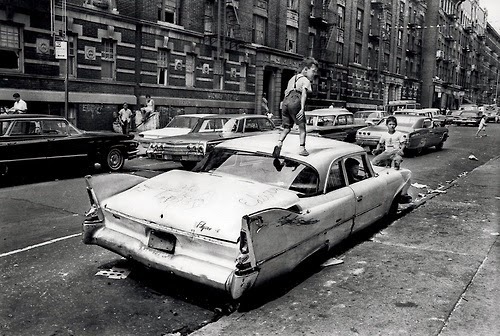 On Fox Street in the Bronx, an abandoned Plymouth Savoy becomes a jungle gym for kids to play on in the summer of 1966. 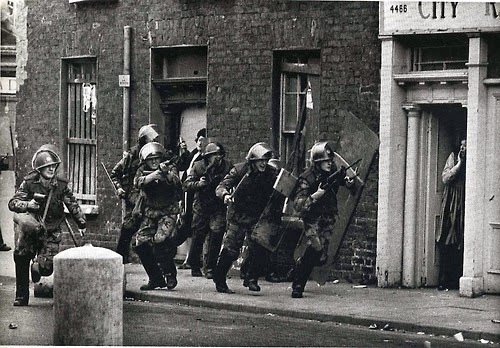 Battle of Bogside in Derry, Northern Ireland - a three-day riot in the Bogside district between the RUC and the Nationalist / Catholic residents, 1969. 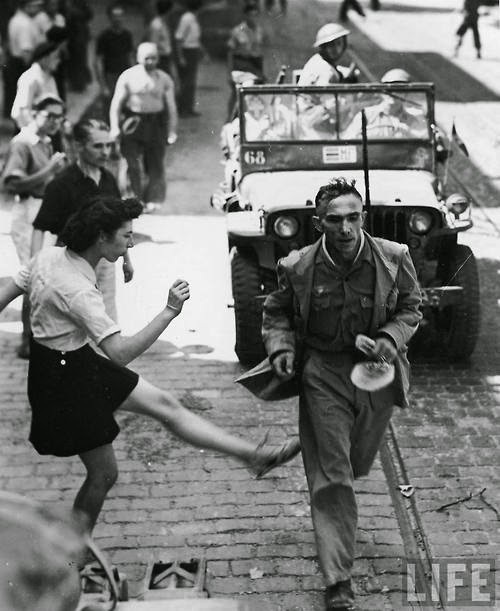 French girl vents anger by kicking at a passing German prisoner of war on his way to confinement after being captured. September 26, 1944. 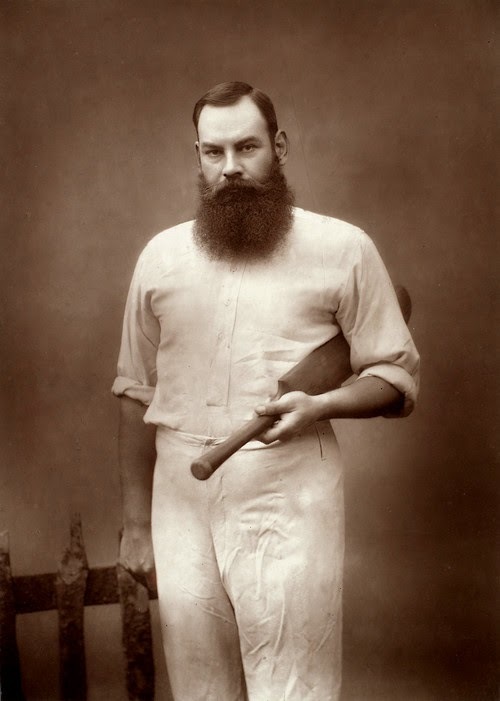 Portrait of English cricketer W. G. Grace who helped develop the sport of cricket and participated in 44 seasons (1965-1908) Photo by Herbert Rose Barraud, Circa 1880. 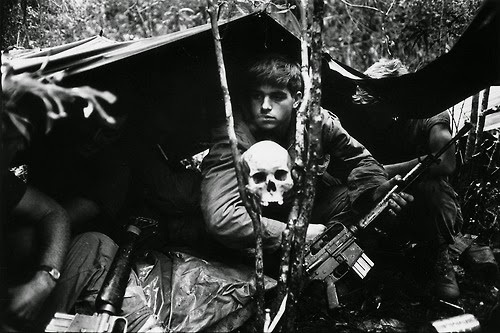 A human skull keeps watch over US soldiers encamped in the jungle during the Vietnam War, October 25, 1968. 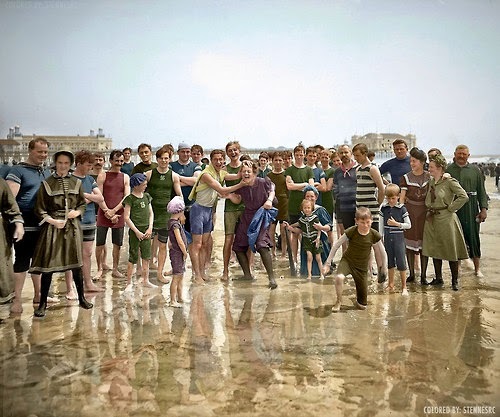 "On the Beach" Atlantic City, Colorized Photo - Circa 1905. 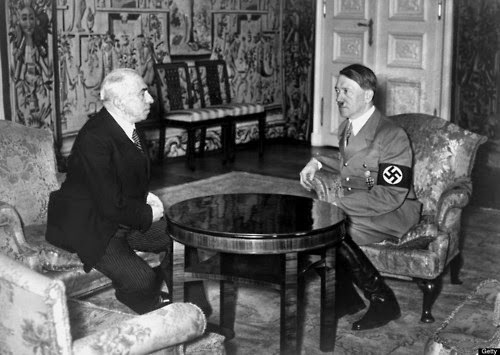 Adolf Hitler informs Czech President Emil Hácha of the imminent German invasion of Czechoslovakia on March 15, 1939 in Berlin. Hácha suffered a heart attack during the meeting, and had to be kept awake by medical staff, eventually giving in and accepting Hitler’s surrender terms. 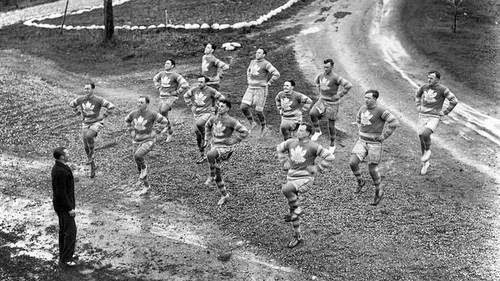 A Corporal from the Royal Canadian Regiment leads members of the Toronto Maple Leafs Hockey Club in training, 1928. 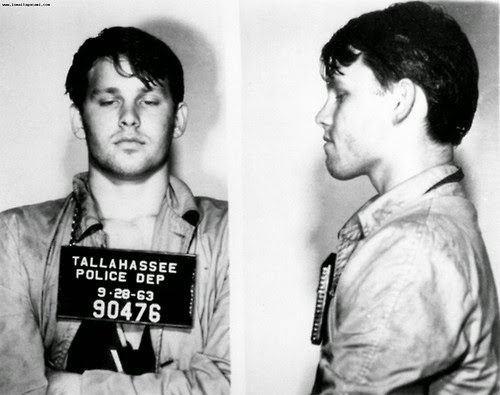 Jim Morrison, who later became the lead singer of the Doors, mug shot when arrested for drunken misconduct at age 20 after a football game in Tallahassee, Florida. Sept. 28, 1963. 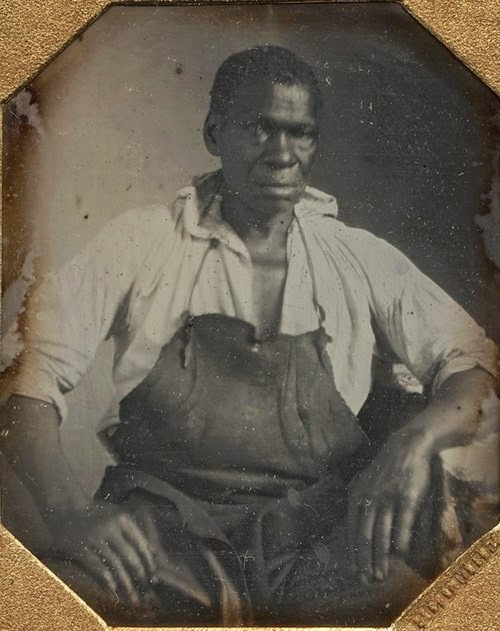 Portrait of Isaac Jefferson (Granger), Circa 1845 – Salve owned by Thomas Jefferson who was a metal worker at Monticello. Jefferson originally gave Isaac and his family to his daughter Maria as a wedding present in 1797 but later gained his freedom in 1822. Photo from the deck of the ocean liner SS Vestris as it is sinking off Hampton Roads. 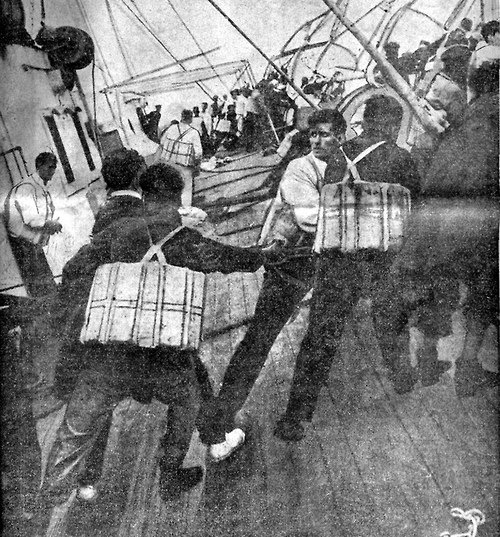 Passengers reach for life jackets as the ship lists sharply. The event resulted in the loss of 112 people, November 11, 1928. 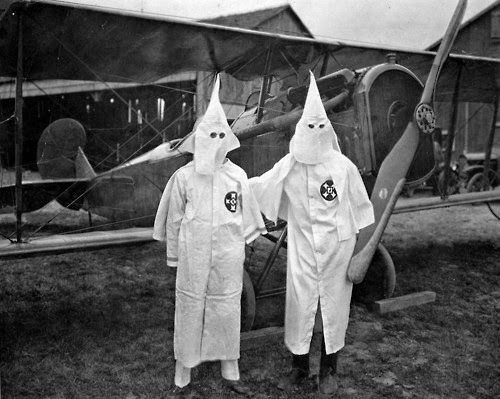 KKK takes to the air to drop propaganda leaflets, 1924. 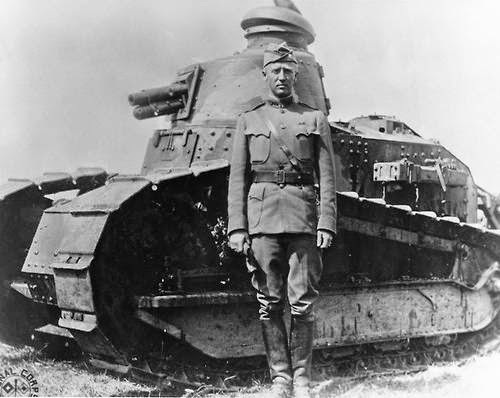 Lieutenant Colonel George S. Patton in France standing in front of a Renault FT tank, summer of 1918. 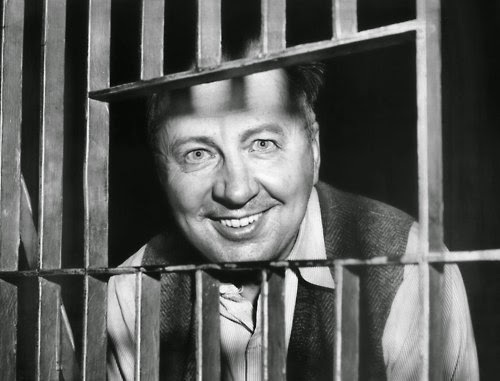 George Metesky, known as the “Mad Bomber”, peers through the bars of his cell at the Waterbury, Conn., Police Station. From 1940 Metesky terrorized New York City by planting 32 pipe bombs in public areas until his arrest 16 years later in January 1957. 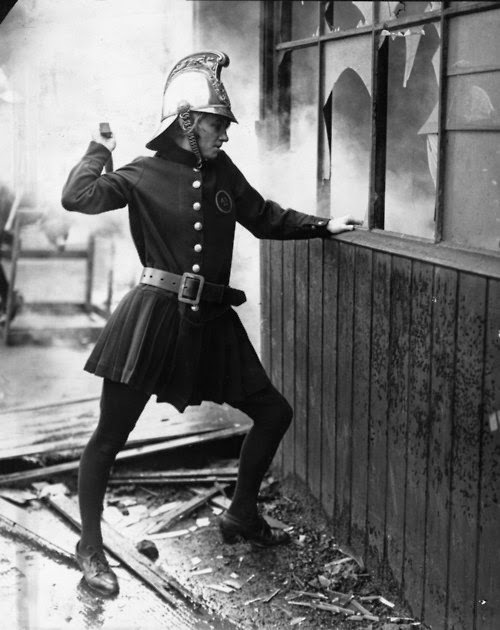 A member of the Achille Serre Ladies Fire Brigade in London, 1926. 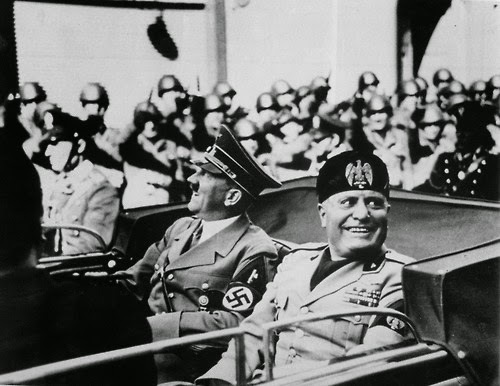 A very happy Mussolini during Hitler’s visit in Florence, Italy – 1938. 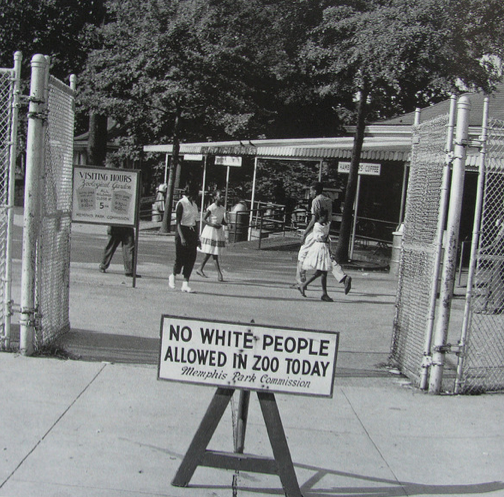 During the era of racial segregation in the south, this sign at the entrance to the Memphis Public Zoo meant that it was Tuesday - the only day black people were allowed to go to the zoo. On the other six days of the week, the sign excluded black people from entering. Photo by Ernest C Withers 1959. 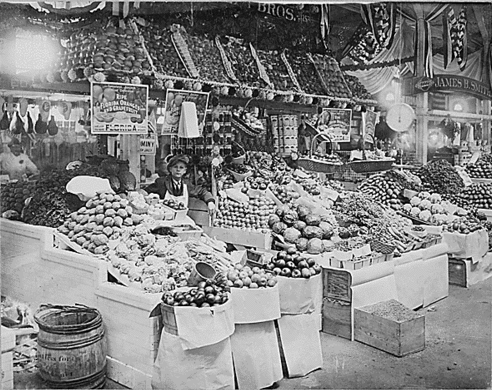 Young boy tending a freshly stocked fruit and vegetable stand at a city market, 1915. 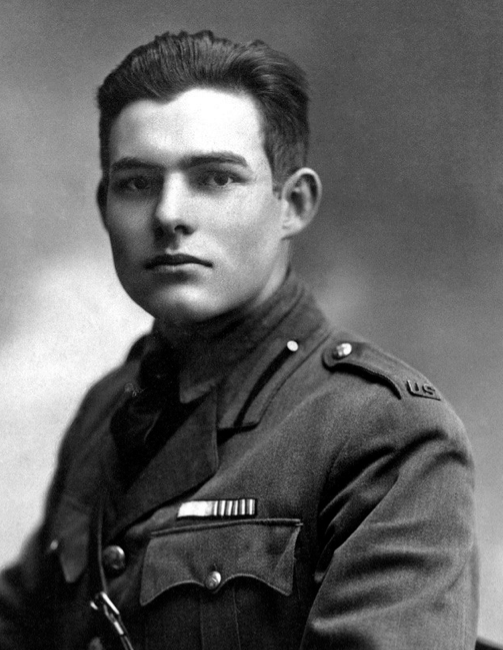 Ernest Hemingway as a war correspondant at age 19, photo taken in Milan, Italy, 1918. 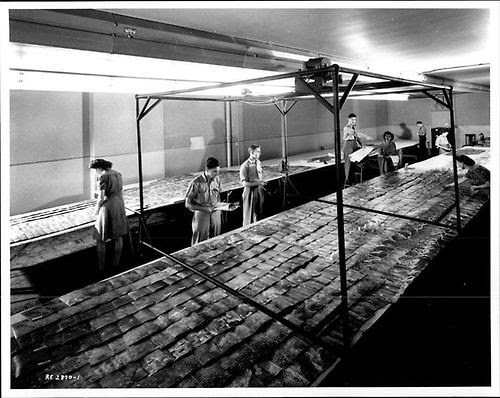 Cartographers arrange hundreds of aerial photos in preparation for a new map at Print Layout Section Number 1, Rockcliffe Airbase, 1945. 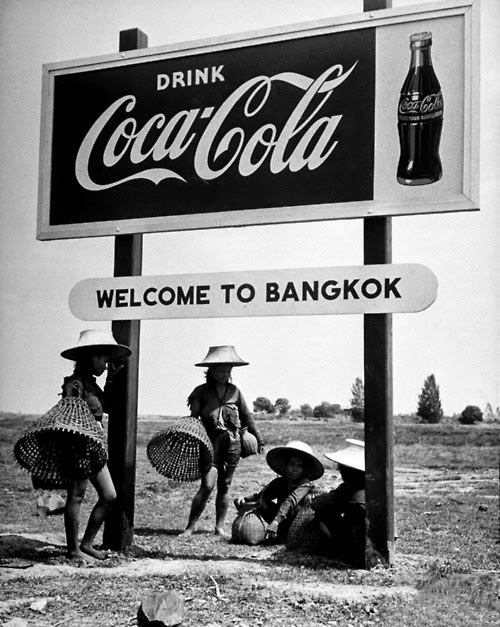 Welcome to Bangkok, Drink Coca-Cola, Photo by Dmitri Kessel 1950. 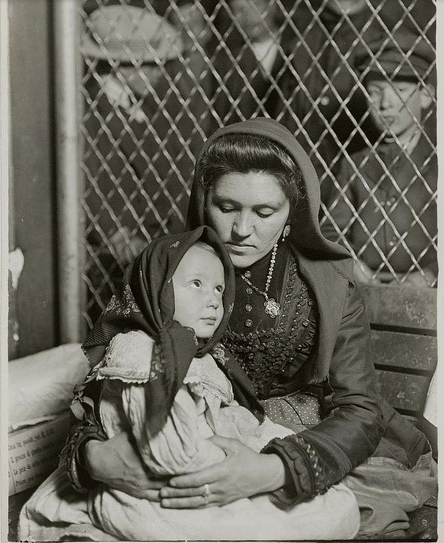 Italian Mother and Child, Ellis Island, New York, 1905, Photo by Lewis Wickes Hine.